This would cover inspections that are “informal” but are conducted by a licensed termite professional. If you find a mud tube that you suspect may be termites, a professional can come out and inspect it for you. The difference between this type of inspection and the one below is that no formal report is generated. This type of inspection may be free or less than a formal (WDI) inspection. 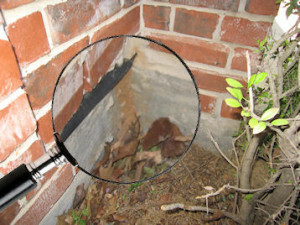 This inspection is “formal” and requires a report signed by a licensed termite professional. This report is typically required by a lending institution when a house is being purchased or refinanced. Wood Destroying Insect reports cover any wood destroying insect such as carpenter ants, powder post beatles, carpenter bees and old house borers. The cost of this report can vary based on the foundation type. If a WDI report is required when purchasing a home, the buyer typically pays the cost. Any wood destroying insects or conducive conditions listed in the report will require correction by most lenders or purchasers. Termite swarmers inside the home are a good indication of infestation. Swarmers typically fly in the spring. See the Termite page for pictures and information. If you are remodeling and find live insects in the walls check the picture on the Termite page to see if they look like termites. Termites build tubes to travel in so that they can stay protected from the elements. Pictures of a mud tube are shown below. Do not confuse mud dobber (wasp) nest with termite tubes. Mud dobbers use mud but will leave an exit hole. Their nests will also be filled with dead spiders or other insects. Termites will leave small stacks of dirt on walls or wood. 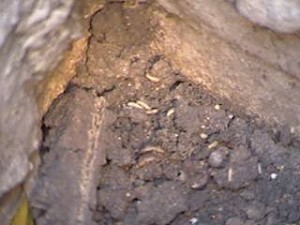 If you see a small tube like pile of dirt or mud in a corner or on a flat wall, you may have termites. Check door moldings and floor moldings for damage. Look for wood that has galleries or paths cleared through it. Carpenter ants will damage wood also, although their galleries are clear of dirt and mud. Termites eat wood and cause it to become soft and weak. If you tap wood with a screwdriver and find it to be soft you should investigate further. Termites make small “pin hole” like holes when they start eating wallpaper. They also eat the backing from the paper so look for paper that has a thin appearance. 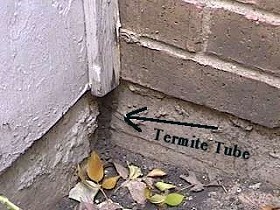 Note that the homeowner has the soil well below the brick line, so the termites built a tube to get into the house. 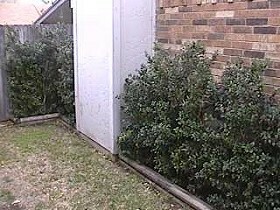 Be sure to pull back all the landscaping and check the entire foundation. The less accessible areas are favorites for termites. Here is a close up of what the tube had inside. The little white “worm” looking critters are the termites. 2. Look up at the eaves & gutters: As we walk around the foundation of your home we look up at the eaves and gutters. Termites are not scared of heights. We may find mud tubes in corners. 3. We check every room inside: Termites will create mud tubes inside as well. We check walls and ceilings for brown dirt. Termites will leave stacks of dirt on walls and ceilings. Check wallpaper for “pin hole” like damage and look for discoloration or “thinness” as if the backing has been removed. 4. We look very carefully in bathrooms: Use a pair of pliers to pull back any carpeting. Sometimes termites will travel along the carpet tack board. Again we look for mud or signs of moisture. We check around tubs and showers. We check the bath trap and check any wallpaper closely for tiny pin holes or discoloration that could be caused by termites. We use our flashlight and look under vanities and behind commodes. 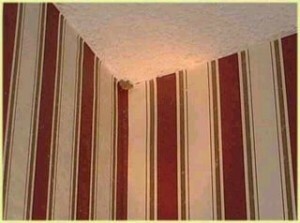 In the picture below you will see the small amount of “mud/dirt” in the upper corner of a bathroom above the wallpaper. 5. We look very carefully under sinks: We check under your kitchen sink or wet bar sink the same as you did the bathroom. Again, we’re looking for mud tubes, dirt or signs of damage. 6. We check around the hot water heater: A favorite spot for termites. Hot water tanks that are in small closets provide excellent warmth and moisture and are rarely undisturbed. The plumbing typically provides the access. We use our flashlight to look all around your hot water heater. 7. Check supports & beams in attic: The attic is a difficult place to do a thorough check because of insulation and inaccessible areas. We do our best to check beams and decking for termite tubes or damage. We use our flashlight to look high and low. 8. 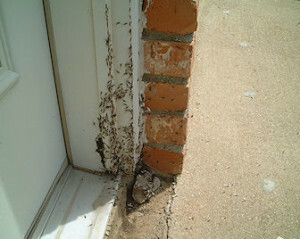 We check the entire garage: Termites will attack your garage, or start in your garage and work their way to your home. We find termites in garages quite often, therefore we recommend a complete search. Detach garages should be reviewed also. We check around the walls for signs of dirt or mud. Check for tubes both inside and out. 9. We check closets: Closets provide the dark areas that termites like. We are sure not to skip closets while doing our inspection. Termites can easily navigate your stuff so a full undisturbed closet is attractive to these pests. 10. We check for high moisture areas: Termites need moisture. 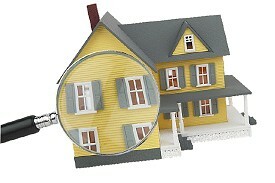 Checking the structure carefully for areas that are damp or wet is a critical part of our inspection. Leaking plumbing is a great clue that termites may be present. Outside areas that stay damp from sprinklers or air conditioning drains will be conducive to termites. There are some areas that are just not accessible in your home. Do your best to check these areas out but understand that there are places these tiny insects can go that we can’t see. What if you find termites? The above tips should help you conduct a termite inspection. If you find live termites or see signs indicating they might be present, contact Metro Guard so that we can send a professional termite technician to confirm your findings. DO NOT SPRAY ANY PESTICIDES ON THE TUBES OR AREAS IN QUESTION !! This will only make it more difficult for the technician to evaluate your problem. Please see our Treatment page for information on how termites are treated and why treating the tubes will not solve the problem. If you have any questions, call us or use our contact form.